Got some files in .dav extension and want to play them on Windows 10, Windows 8 or Windows 7 computer? Playing DAV files is not quite a difficult task in Windows as there is a free DVR365 Player working for Windows PC. However, there is still some problem to play them. Even the omnipotent VLC player can do nothing for DAV files. Then, is there no way to play DAV in Windows 10/Windows 8/Windows 7? Don’t worry, this article introduces a free DAV player for Windows 10/8/7 to help you play DAV on Windows 10/8/7. If you need further convert DAV files to play with Windows Media Player, VLC, Android devices, etc. The powerful DAV Converter for Windows 10/8/7 can help you to convert all kinds of DAV files to MP4, MOV, ProRes, AVI, WMV, FLV, MP3, WAV, M4A, etc. DAV Player for Windows 10/8/7: How to Play DAV in Windows 10/8/7 Easily? Free download UFUSoft DAV Player for Windows 10/8/7. Install and launch the program. 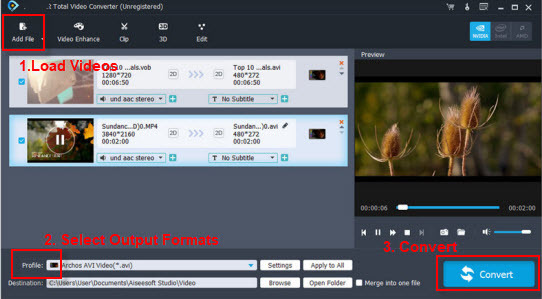 The DAV player is a built-in player in the Video Converter application. If you only want to play DAV files in Windows, you do not need register the program. The free DAV player works for Windows 10, Windows 8.1, Windows 8. Windows 7, Windows Vista, Windows XP, etc. How to Play DAV files on Windows 10/8/7? 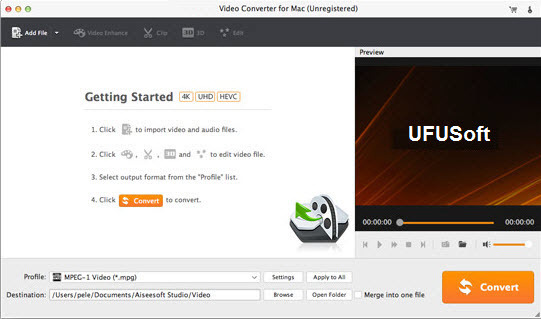 Open Video Converter. When the registration window opens, click “Order Later”. Press on “Add File(s)” button to add dav files to the program. Highlight a DAV file and Click on the “Play” button in the preview section of the program to start to play DAV files on Windows 10/8/7. DAV Converter for Windows 10/8/7: How to Convert DAV to MP4, MOV, ProRes, MP3, WAV, etc.? To Play DAV on Windows 10/8/7 with the built in DAV player for Windows 10/8/7 in UFUSoft Total Video Converter is for free. However, if you want to convert DAV to MP4, MOV, ProRes, MP3, WAV, etc. to play in Media Playe, VLC, Android, QuickTime, iTunes, Apple TV, iPhone, iPad, or edit in Movie Maker, Sony Vegas, Premiere Pro, Avid, etc, you can pay for registration code from the buy link built in the program. Free download DAV Converter for Windows 10/8/7. Install and launch the program. Press on “Add File(s)” button to add dav files to the program. Or you can directly drag and drop the dav files to load to the program. Click on the “Profile” drop-down list to choose video or audio format that you want to convert DAV files to. Press on the “Convert” button to start convert DAV to MP4, MOV, MP3, WAV, etc. on Mac. Then you can easily play DAV files anywhere you like. How to Rip or Copy Audio CD to iPhone 8 (Plus) or iPhone X? Avid DAV Solution: How to Convert DAV Files to Avid Media Composer?